"The Pumpkin Of Nyefar" from Tod Polson on Vimeo. 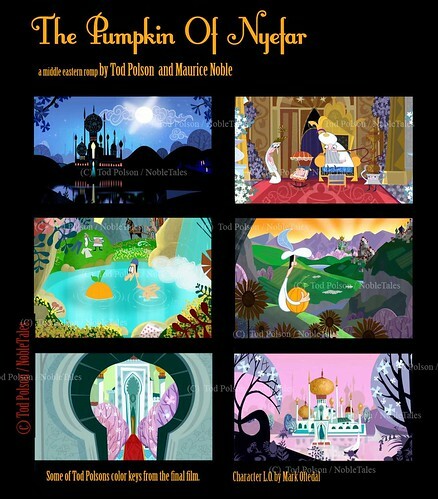 "The Pumpkin Of Nyefar" is a personal hand animated short film I wrote with Maurice Noble (Duck Dodgers in the 24½th Century and What’s Opera, Doc?) in Turkey, and co-directed with Mark Oftedal (Toy story, A Bugs Life) at the "Wang film studios" in Taiwan, and Bangkok. The film is narrated by June Foray (the voice of Rocky in Rocky and Bullwinkle). 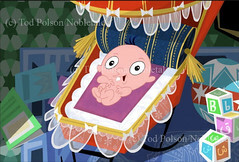 Above: Some stills and color keys from the film. Character designs and character layouts by the amazing Mark Oftedal. 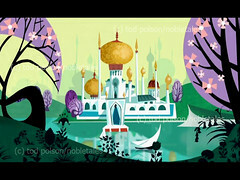 In 1994, Maurice Noble began training a group of young designers at Chuck Jones Film Productions. A lot of us were working on our own personal short projects, several of them based on ethnic folktales. Maurice thought it would be a great idea if the group of us could develop a series of shorts inspired by stories from around the world. We called this series “Noble Tales,” and we, his trainees, became known as the “Noble Boys” (which also included a few girls). Many of us traveled around the world and developed and together designed several dozen idea. “The Pumpkin Of Nyefar” was one short idea Maurice and I wrote while visiting Turkey. Our first morning in Istanbul we came downstairs to the dining room and around the table were twenty belly dancers and a lot of pumpkin dishes. All the girls of course were smitten by Mr. Nobles charm. Ha ha… I can still see him grinning from ear to ear. Afterwords we talked things over, and decided to write a story about a prince who could marry any beauty in his kingdom, but instead chooses to wait for true love. 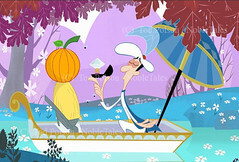 As fate would have it, the prince finds true love in the form of a pumpkin. While I was supervising a TV show in Thailand, James Wang (Wang Flm) invited Maurice and I to use his Thai studio to make our short. Maurice underwent surgery so that he could make the flight to Bangkok. Unfortunately he died a few weeks later. I came to Thailand a few months later to work on the short myself. But my friends didn’t leave me to do the film alone. Soon after, my pal Mark Oftedal, came to town for a visit. His short vacation, turned into a several year working holiday. He became so involved with the project, re-working designs, storyboards, editing, setting the animation style, that he became the co-director. It was very much a partnership and it was fantastic working with such a talented fellah. Other friends from America helped out too. June Foray donated her voice to the film. Ben Jones, and Lawrence Marvit both did short stints in Bangkok to help get things going. Sue Kroyer did a lot of inspirational character design as did Roman Laney. Jules Engel looked over a lot of the early design and color. Aaron Sorenson, Dave Marshall, Dave Thomas, and Mike Polvani all donated time to the project. It was really a great collaboration of friends, just the way Maurice had dreamed about: doing a short film together, everything donated, just because they wanted to do it. Hi Tod, Great stuff here. Your work always inspired me.